Instrotech’s Model SCBR LED display. NEW wall mounted indicators for digital and serial inputs are available from Instrotech . 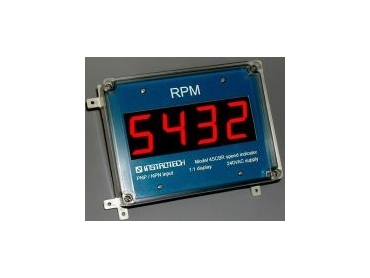 Model SCBR may be supplied for use as a serial slave display, or for counting/totalising, or for rate/speed display. There are 4-digit versions with 38mm high red LEDs, and 6-digit versions with 20mm high red LEDs. All have IP65 wall mount housings, may be supplied for ac or dc auxiliary supply voltages, and provide integral sensor excitation. Serial ASCII input models are supplied as standard for RS232 single display applications, and for RS485 multiple displays on a 2-wire bus. A maximum of 255 addresses are user programmable, with address 0 being reserved to address all the indicators on a bus. For counting or rate applications, the inputs may be from contact closures, or from NPN, PNP or Namur sensors. Virtually any divisor or multiplier factor may be factory programmed to suit customer’s rate or total applications. These indicators are Australian made, comply with the C-Tick EMC/EMI regulations, and carry the 3-year guarantee standard on all Instrotech instruments.